Home Lifestyle Art Could razing Hitler’s first home backfire? The Austrian government has announced that it will demolish or completely remake the house where Hitler was born 127 years ago in the Austrian town Braunau am Inn. The news has brought a new round of unwanted media attention to the small locale on the Inn River near the German border. The 17th-century building, part of the town’s historic fabric, has been empty since 2011. When the Hitler family lived there, the building contained apartments as well as a tavern on the ground floor. Most recently, it housed a center for people with disabilities. For decades, it has attracted Nazi sympathizers and curious tourists – an uncomfortable reminder of a time when locals proudly proclaimed their connection to the dictator. The government, unable to reach an agreement with the owner, who refuses to sell, has already begun expropriation proceedings to legally seize the property. Interior Minister Wolfgang Sobotka announced that the house would be demolished down to the foundations or otherwise rendered unrecognizable through an architectural makeover. The aim, Sobotka says, is to stop neo-Nazi pilgrimages. Until Hitler began consolidating power in the late 1920s, he seemed to care little about where he lived. After World War I, for example, he subletted a small room from a couple in Munich and sparsely decorated it with just a few pieces of furniture. In 1928, however, he rented a chalet on the Obersalzberg, an Alpine resort near the Austrian border. This would become a Nazi political hub: Hermann Göring, Martin Bormann and Albert Speer had homes nearby. The next year, Hitler retained a luxury apartment in Munich. Even though he moved into the Old Chancellery in Berlin after he became chancellor, Hitler maintained the other two. All three were thoroughly renovated in the mid-1930s to facilitate the creation of a new, sophisticated persona for the Führer. After Hitler committed suicide in 1945 and Germany surrendered, legacies of Hitler and Nazi Germany – the Führer’s homes included – remained. In the immediate postwar years, there was some confrontation with that past. But decades of silence and avoidance followed. Many wanted to remove National Socialism’s traces from urban landscapes, which meant destroying the buildings of the Third Reich or repurposing them beyond recognition. Their power, it was argued, would be neutralized. But this would also make it easier to pretend that they had never been there at all. The Old Chancellery, damaged by bombs in 1944, became part of the Soviet sector of allied-occupied Berlin and was demolished. East Germany didn’t acknowledge the history of the site, but after reunification in 1990, the City of Berlin posted a historical marker. Hitler’s Munich apartment building, meanwhile, emerged unscathed from the war. 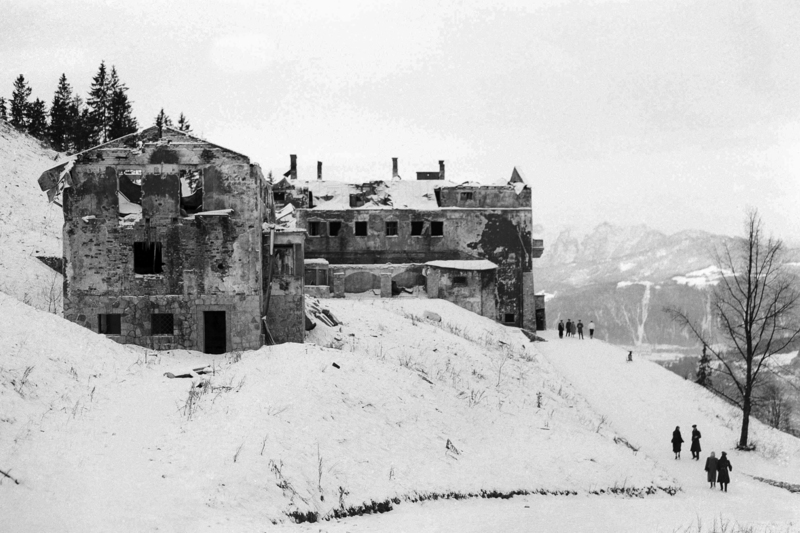 But his mountain retreat on the Obersalzberg, the Berghof, was damaged by British and American air forces. In the intervening decades, Hitler’s homes have had a long and troublesome afterlife. Various strategies have been tried, some more successful than others. 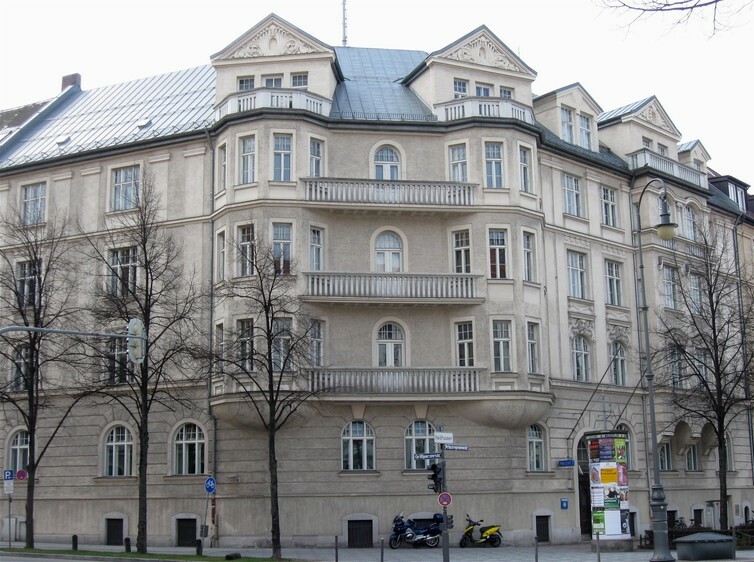 Today, the dictator’s Munich apartment, where he once hosted Neville Chamberlain and Benito Mussolini, occupies the third floor of a police station. The public can still visit the building. But they must walk past security cameras, request permission to enter through a locked street door and, after climbing a flight of stairs, enter a police reception area, a room that once housed Hitler’s bodyguards. This is the only space “open” to the public, and those not on police business are discouraged from lingering. Admittedly, the strategy works to keep away neo-Nazis and curious tourists. But it’s also turned the building into a virtual fortress. Hitler’s Munich residence is now a police station. As for the Berghof, in the early 1950s, there were reports that its ruins had become a meeting place for Nazis, old and new. In response, state authorities outlined a plan to remove the remains and reforest the grounds. The decision was unpopular among many locals, including merchants who had profited from postwar tourism to the mountain. In the months leading up to the demolition, heated debates in the local papers spilled out into beer hall brawls. This only reinforced the authorities’ resolve, and on April 30, 1952 – the seventh anniversary of Hitler’s suicide – the Berghof was dynamited, an event covered by the international press, including Life magazine. The remains of Hitler’s famous ‘Berghof’ (mountain house) near Berchtesgaden, Germany. Afterwards, the authorities, insisting that there was nothing to see, did not intervene in the site beyond posting “Do Not Trespass” signs. But in doing so, they created a void into which any kind of meaning could be projected. Local merchants didn’t have to worry about their bottom line; the stream of visitors actually increased after the house was demolished. By the mid-1960s, the wooded grounds where it had stood had become one of the the largest unadvertised tourist attractions in Germany. Busloads of tourists arrived to mull around the house’s foundations. Neo-Nazis also made their presence felt, carving swastikas on trees and leaving behind altars to Hitler. 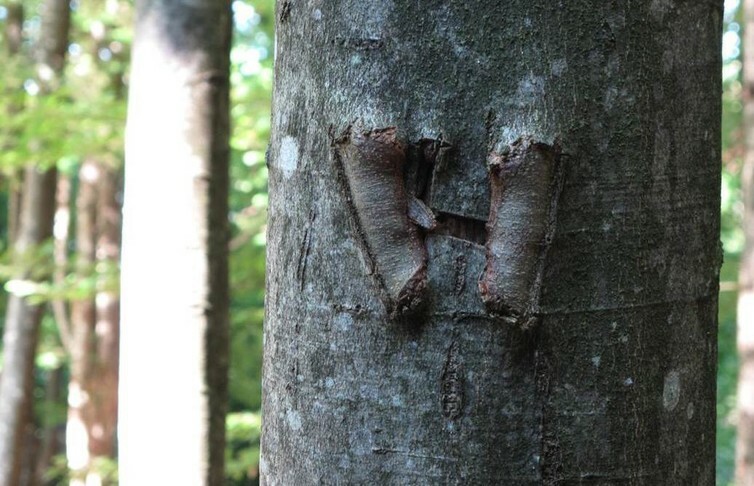 An ‘H’ carved into a tree on the grounds of the Berghof, Hitler’s former retreat on the Obersalzberg. In 1999, the government opened the Obersalzburg Documentation Center Dokumentation Obersalzberg to use education to combat the ignorance and hatred being expressed in the woods. A 10-minute walk from the Berghof grounds, the center offers extensive displays on the mountain region’s relationship and history with National Socialism. The enormously popular destination has drawn 2.5 million visitors to date. Since its opening, traces of neo-Nazi activity in the vicinity have notably dropped off. In an op-ed published on Oct. 20, The New York Times editorial board argued for demolition, saying that the historical significance of the house at Braunau am Inn is minimal: Hitler’s family lived there only a short time, Hitler himself showed no interest in the building and no important decisions were made there (unlike, say, the Wannsee villa, where the coordination of the Holocaust took place). This stance downplays, however, the role of the house as a destination of Nazi pilgrimages during the Third Reich. Those associations with the Nazi Party and Hitler’s faithful deepened postwar perceptions of the place as a stain on the town’s honor. But trying to wipe it out with a wrecking ball underestimates the immaterial power of memory. Over the years, various alternative solutions have been proposed for the house, including turning it into a museum and place of reconciliation. Why such cultural approaches are now being rejected is unclear. Perhaps it has to do with fears that a change in the political winds – as far right parties grow in Europe – would leave the house vulnerable to reappropriation in the future. But as the earlier treatment of the Berghof shows, a void is no more secure – and perhaps even more dangerous. What do world university rankings actually mean?